The University of North Carolina Hospitals is rededicating the John M. Reeves All Faiths Chapel at North Carolina Memorial Hospital, Chapel Hill, on October 24, 4 p.m. This chapel was first built 50 years ago through the generosity of North Carolina American Legionnaires. The chapel’s history includes the America Legion financial contributions more than 50 years ago when Pastoral Care began in the hospital. The wording for the chapel history includes: “this chapel represents continued service to the citizens of NC by the American Legion” and John M. Reeves Family. Memorial Hospital was the first hospital built on the University of North Carolina at Chapel Hill campus and is named in honor of North Carolinian men and women who have given or will give their lives while in the armed forces. 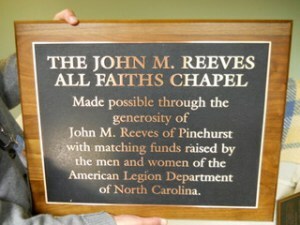 The John M. Reeves All Faiths Chapel was made possible by Mr. John M. Reeves and by matching funds from the men and women of the North Carolina American Legion. American Legionnaires and local veterans are urged to gather at UNC hospitals on October 24th 4 p.m. for the rededication of John M. Reeves All Faiths Chapel.